The curriculum is at the heart of the College vision and values. The intent is to provide a progressive curriculum that enables students and staff to build on their knowledge and understanding, resulting in a “deep sequenced learning experience” for all. 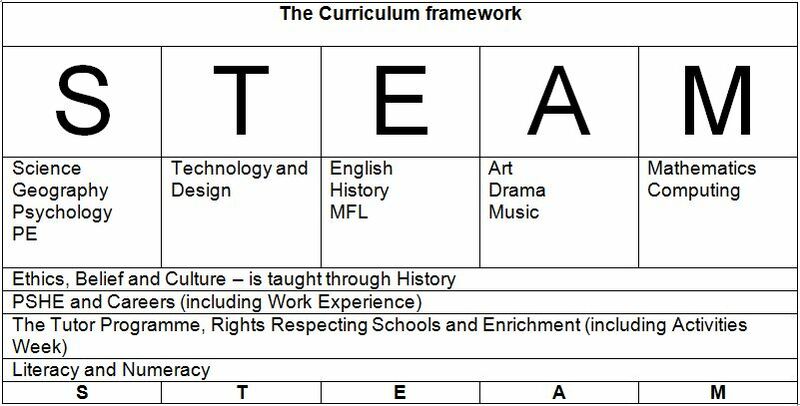 The curriculum is built around “STEAM” during a 3 year KS3 framework. The intent is that students build on their knowledge and understanding from KS2 and further scaffold their “long term memory” during this period to fully prepare for their KS4 option choices. The knowledge and content learnt at KS2 is revisited and contextual knowledge that facilitates success at KS4 is embedded with the aim of consolidating, extending and challenging individual learning. The curriculum narrative contains a 2 year KS4 framework in which students are able to select a range of subjects in addition to English, Mathematics and Science (combined or separate) to further build on their knowledge and understanding, enabling each student acquires a “deep body of knowledge” for their next stage of education. The curriculum culminates with a 2 year KS5 framework in which students are able to select subjects to deepen their knowledge and understanding for their chosen next stage. What type of young people do we want to develop from the College curriculum? Torpoint Community College provides learners with a broad curriculum with the intention to provide students with the knowledge and understanding to become “Inspired Optimistic Life-Long Learners”. The knowledge and skills achieved by students will equip them for their chosen lives ahead. The College is committed to the CPD of staff as it is recognised that learning is a life-long experience and journey. Each part of the curriculum, the subjects, has a planned intent, implementation and impact through a sequenced scaffolding structure, where every subject is integral to ensuring a high quality curriculum provision; learning is designed with: clear intentions; a scaffolded structure for implementation and a strong vision for impact over time. The approach to designing learning is based on the principle that skills and knowledge are “sticky”, providing a deep learning experience for students. The term STEAM can be used to describe the curriculum in terms of knowledge, learning and remembering. For example from a scientific spin, the atoms of steam are moving rapidly, colliding and reacting, providing a visual model of deep learning. STEAM can also be thought of in terms of a “STEAM ship” – a vessel moving forward cutting through water. At Torpoint Community College the curriculum is not confused with assessment and qualifications. The curriculum is not narrowed, but a broad range of subjects are taught and offered to all students. There is vast curriculum knowledge and expertise at the College and teachers are committed to consistently developing their pedagogical expertise. Students have the opportunity to apply to the UTC and the Creative Arts College in Plymouth for a more specific and narrowed curriculum of their choice. The curriculum at Torpoint Community College provides students with stability in education, through bold leadership, ethical leadership and community leadership. Curriculum gaming has no part to play in the curriculum framework at this College. The distinction of the curriculum at Torpoint Community College is that a broad curriculum is offered, including a 3 year KS3 framework to ensure students are not starved of the National Curriculum before making choices for their future.